For the Johnny Bristol song, see Hang on in There Baby. Hang in there, Baby is a popular catchphrase and motivational poster. There were several versions of the "Hang In There, Baby" poster, featuring a picture of a cat or kitten, hanging onto a stick, tree branch, pole or rope. 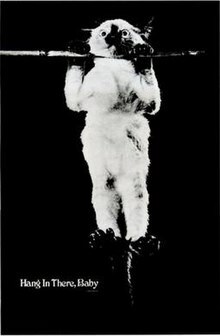 The original poster featured a black and white photograph of a Siamese kitten clinging to a bamboo pole and was first published in late 1971 as a poster by Los Angeles photographer Victor Baldwin. It has since become a popular relic of the 1970s. Victor Baldwin owned a portrait studio in Beverly Hills, California, photographing famous clients including Frank Sinatra, Sammy Davis Jr., and Ronald Reagan. His first love was animal photography, and he worked both in animal portraiture and as photo editor at Cat Fancy and Dog Fancy magazines. In 1956 he and his then wife Jeanne Baldwin coauthored a children’s book titled Little Kitten, Big World, featuring a Siamese kitten named Simmy. In 1963 he photographed another of his Siamese kittens, Sassy, in various acrobatic poses, including the “chin up” on the bamboo pole that would later be used for the "Hang In There, Baby" poster. In 1970 Victor and Jeanne produced the book, The Outcast Kitten, featuring the photographs Victor had made of Sassy and other cats he owned at the time. Sassy, who has the fictional name Wiki in the book, is a lost kitten adopted by a mother cat with two kittens of her own. He attempts to be accepted by his adoptive siblings by performing acrobatic tricks. The “chin up” image is used within the book as well as on the back cover. Before it was published as a poster, fans of the book wrote requesting copies of the photograph. It was also used to sell subscriptions to Cat Fancy, prompting more requests. Baldwin, himself a fan of the picture, saw an increasing demand and so produced it as a poster, choosing the words “Hang In There, Baby” to accompany the image. Baldwin hung a copy of the poster in his studio window in 1972, which resulted in more interest in the image. The first copy of the poster was sold to composer of The Music Man Meredith Willson, who asked for it to be framed. More requests came in, and soon Baldwin was fulfilling orders for one to ten gross per day. When his studio business began to suffer he hired a staff to keep up with the orders. 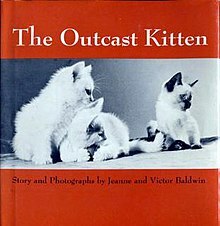 The Outcast Kitten, by Jeanne and Victor Baldwin, featuring "Sassy" the kitten. The poster struck a chord with 1970s Americans and became one of the best selling posters of the era. Baldwin received letters from people telling him that the poster helped them through recovery from surgery, accidents, and other difficult events. Baldwin himself said “she gave solace and strength to people everywhere, in all sorts of trouble, including myself”. By 1973 Baldwin had sold 350,000 copies at $2.00 each. He lived for a time solely on the income from the posters, taking a break from his studio work, something he admitted he would rather be doing than selling posters. The poster’s popularity spawned imitators, and for a time, dozens of versions were available, using photographs or images of different cats – including at least one “blacklight” version - all with some variation of the “hang in there, baby” text. Some were bootleg copies of the original, and some were produced by major greeting card and poster publishers. Baldwin had held the copyright to the original photograph since March 1, 1970, and to the poster with text since December 7, 1971. “As a matter of integrity” Baldwin sued each infringement he could find, winning every case. He was awarded just enough to cover legal fees. By the time the poster’s initial popularity had waned, Baldwin estimated over 10 million unauthorized versions and direct copies of the poster had been made. Baldwin did receive a few complaints from people who felt that posing a cat as depicted in the poster constituted animal cruelty. Formerly a humane officer and a lifelong lover of animals, especially cats, Baldwin assured those concerned that Sassy climbed up on the pole on her own and held onto it only briefly while playing. According to his nephew Roger Garrett, Baldwin spent a long time patiently waiting for his subject, and took 40 or 50 shots to get the “Hang In There, Baby” photo. In 1973 Vice President Spiro Agnew, charged with accepting $100,000 in bribes while holding office as Baltimore County Executive, Governor of Maryland, and Vice President, was allowed to plead no contest to a lesser charge as long as he agreed to resign as Vice President. In September 1973, while he was considering his situation, Representatives William L. Dickenson, Republican from Alabama, and Samuel Devine, Republican from Ohio, presented him with a "Hang In There, Baby" poster signed by 100 Members of Congress as a token of encouragement and support. Agnew resigned on October 10, 1973. President Nixon also received a copy of the poster from a supporter during the Watergate scandal. Another copy of the kitten poster hangs in an outer office of Canadian Prime Minister Justin Trudeau. The vintage poster originally belonged to his father, former Prime Minister Pierre Elliott Trudeau. Victor Baldwin made approximately $700,000 from sales of the posters, much of which went to settle his divorce, which he was apparently happy to spend it on. Baldwin produced other animal themed posters throughout the 1970s, as well as licensing a wristwatch, mugs, glasses and other products featuring the "Hang In There, Baby" cat image. The original poster was one of the earliest motivational posters, and is now considered collectible, often selling for many times its original value. Western artist Lloyd Mitchell painted End of the Line in 1974, depicting a cowboy dangling from a horse which is itself hanging off a cliff roped to a steer. The subtitle of this print is "Hang in there, ol' buddy!" In Terminator: The Sarah Connor Chronicles, the human Resistance uses "Hang in there, Baby!" as a motto. One scene features the original poster, another features a lion gnawing on a Terminator skull, and the phrase itself is repeated throughout the show. A group of time traveling Resistance fighters led by Derek Reese also use one of the original posters to hide a safe containing weapons and money in their apartment. In the film Finding Dory the octopus Hank momentarily hides by camouflaging himself as the cat on a "Hang In There, Baby" poster. In the film Angry Birds, Red is sitting in front of a "Hang in there, Baby!" poster while attending court ordered Anger Management class. In The Simpsons episode "The Twisted World of Marge Simpson", Marge Simpson cheers herself up with the poster before noticing the (incorrect) copyright date of 1968 and comments, "...Determined or not, that cat must be long dead. That's kind of a downer." Also, in the episode "Take My Wife, Sleaze", a hang on cat poster appears on a wall in Ned Flanders' rumpus room when Homer Simpson's biker gang called "Hell's Satans" make their first meeting. On the TV show That '70s Show, during the episode "Stone Cold Crazy", Jackie is seen setting up the original poster in the house she and Fez will live in. The 2003 film The Cat in the Hat features a "HANG IN THERE BABY!" screen including the Cat's white-and-red magic hat, which the film cuts to during a "breakdown" in transmission. In the animated show Dr. Katz, Professional Therapist, Dr. Katz has a "Hang in there, Baby!" poster in his office. On the TV show Becker, during the episode "Amanda Moves Out," to help Becker character give up smoking, Linda put up a poster of a small orange kitty with the caption "Hang in There, Baby!" Becker later suggests the same to his nurse. After he almost relapses, Linda says, "I know a small kitty at the office who's going to be very disappointed." In the film The Hangover Part III, Asian crime boss Leslie Chao uses the poster to cover the entrance to the escape tunnel dug in his cell. The prison commandant who uncovers it during the riot incited by Chao to screen his escape is less than happy. In the animated series Drawn Together, season two, episode eight: "Terms of Endearment", Captain Hero uses x-ray vision to see through the poster on the wall in order to spy on Foxy and Clara. In the series Mad Men, season seven, episode two: "A Day's Work", the poster is visible to the left of a door as Sally Draper enters a dorm room. In the Disney Channel TV show Shake It Up, season 3, episode 2, Funk It Up, CeCe Jones, in her search to higher spiritual knowledge, has a "hang in there, baby" cat poster hung up in her locker at her school. In the animated Disney Channel show Counterfeit Cat, season 1, episode 11, Hang in There, the cat Max teaches the alien Gark about how fragile the universe is and tells him the story about Hang In There Cat. Both the poster and the original cat is seen. A cartoon variation is seen on Family Guy in episode 13 from season 6, “The Former Life of Brian”. The picture is hanging on the wall in the house of Brian’s old ex-girlfriend. A version of the poster is seen on Fear the Walking Dead season 4 episode 4. Nick goes to a library in search of books for motivation and rolls up the poster to take back to the stadium camp. The twelfth episode of the Netflix TV series The Boss Baby: Back in Business is entitled “Hang in there, baby.” The poster is the root of the enmity between Boss Baby and his two nemeses, Mega Fat CEO Baby and Bootsy Calico. In the USA Network TV show Mr. Robot, season 2, episode 5: "eps2.3_logic-b0mb.hc", a "hang in there" image is embedded in the Spectrogram of the audio blip at the end of the introduction (an example of Steganography). The source image is prominently featured as a wall poster in season 2, episode 11: "eps2.9_pyth0n-pt1.p7z". ^ a b c d e f g "'Hang In There' Creator Does". Los Angeles Times. September 3, 1978. ^ Baldwin, Victor; Baldwin, Jeanne (1956-01-01). Little Kitten, Big World. New York: W. Morrow. ^ Baldwin, Jeanne; Baldwin, Victor (1970-01-01). The Outcast Kitten. San Carlos, California: Golden Gate Junior Books. ISBN 0874641489. ^ a b c "Picture of kitten put photog in business". Long Beach Independent. December 11, 1972. ^ Mitchell, Kerrie (July 2007). "The Accidental Icons". Popular Photography: 72. ^ "Agnew Resignation Speculation Grows". Panama City News-Herald. September 22, 1973. ^ Julie Van Dusen (2015-11-29). "Pierre Trudeau's desk retrieved from storage for his son to use". CBC News. Retrieved 2015-11-30.